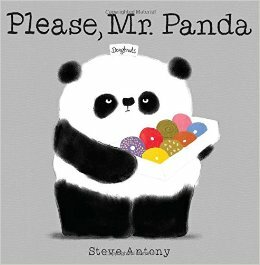 Our Cover to Cover Book of the Month for December Please, Mr. Panda by Steve Antony. This fun book, with beautiful monochromatic illustrations, provides a great opportunity to talk about manners and courtesy. Ask your child why they think Steve Antony chose all the animals in the book. What do they all have in common? “Please” is the magic word! Talk with your child about possible reasons why Mr. Panda changes his mind about sharing his doughnuts. What other kind words are used in the book? Why is it important to use kind words? Please, Mr. Panda is full of cute little critters. Invite your child to talk about the animals they are familiar with. Where do those animals live? Mr. Panda has so many yummy doughnuts to share! Use this simple recipe to make your very own homemade play dough and then create and decorate your own doughnuts for sharing! Tell us about your child’s favorite part of the story. Send a video of you sharing the book together. Send a picture of you and your child making play dough doughnuts. Be creative! We can’t wait to see what you loved about Please, Mr. Panda!